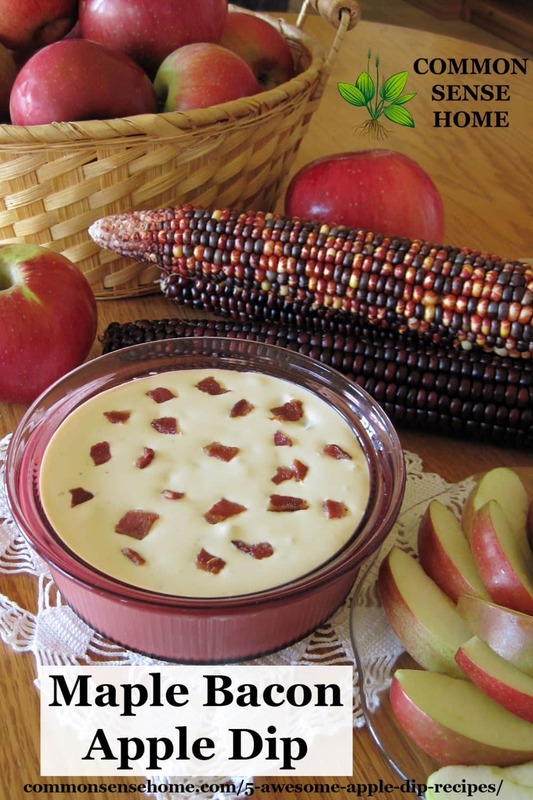 One of my favorite things about fall is apple harvest – and apple dip! The thing is, last year I grabbed a container of caramel dip at the orchard without looking at the ingredients. When we got home, popped the dip container open and tasted it, I knew I had made a big mistake. It tasted like chemical preservatives and the texture was awful. The ingredient list took up one side of the container, and most of it was things that were hard to pronounce. We ended up tossing it. This year I'm prepared! 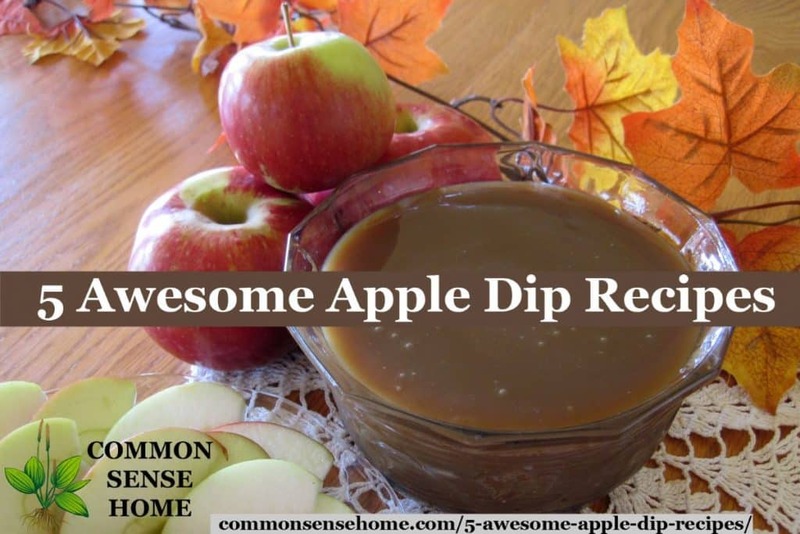 I raided my old recipe books and did some experimenting in the kitchen, and have put together five great apple dip recipes to share with you. 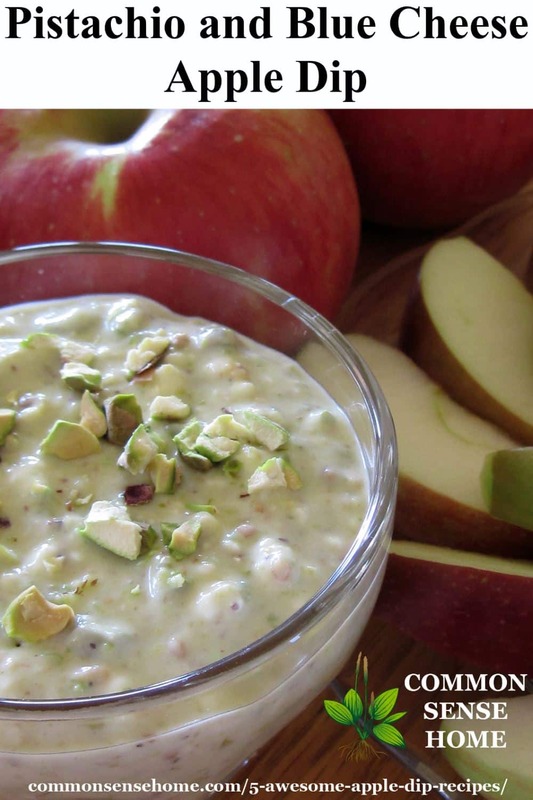 We have Classic Caramel Apple Dip, Chocolate Almond, Maple Bacon, Walnut Ricotta Cream, and Pistachio and Blue Cheese. These are great for snacking or entertaining – heck, you could even add a few more dippers and make a full meal out of dips. Since everything can be prepped ahead, this would be a great option for holiday entertaining. 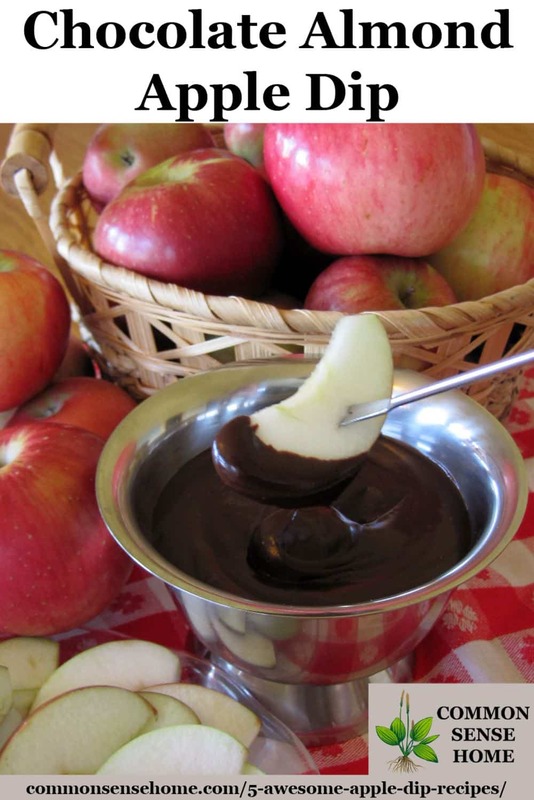 So, without further ado, let's get to the apple dip recipe goodness! No chemicals, high fructose corn syrup or hard to pronounce ingredients allowed! Note: To keep your apples from browning, dip them in lemon juice after slicing. Break egg into a double boiler or heavy bottom saucepan, whisk lightly. Add remaining ingredients. Cook on medium heat, whisking frequently until mixture starts to bubble. Cook for a few minutes, whisking constantly, until thick. Do not boil at high heat or you are likely to overcook your egg and cream. Pour into a heat proof container (I use pyrex); cover and refrigerate. Mixture will thicken more as it cools. Makes around 2 1/2 cups. Keeps for about a week in the fridge. Also goes well with other firm fresh fruits such as pears or not too ripe bananas, and makes an excellent ice cream topping. Note: This dip recipe should be served warm, as it will stiffen up when chilled. Place chocolate, cream and butter into a heavy bottom sauce pan. Melt together on low heat, stirring frequently, until everything is melted and well blended. Add extracts and mix well. Serve in a fondue pot or hot right from the stove. Makes about 1 1/2 cup. Store in the refrigerator for up to one week. Recipe can easily be doubled or quadrupled for a crowd. Also goes well with nut halves, marshmallows, pound cake, shortbread cookies, bananas and other fresh fruit. Simply decadent over ice cream. This one is best whipped up in a stand mixer or food processor to make sure it gets nice and fluffy, although if you don't have either you can mix by hand – just make sure your cream cheese is soft. In a stand mixer bowl or food processor, whip together cream cheese and sour cream. Scrape down sides of bowl and make sure they are evenly blended. Add 2 tablespoons maple syrup. Blend well. Taste. Add more if you like a sweeter dip. Blend in crumbled bacon, reserving a small amount for garnish if desired. Refrigerate and use within one week. Makes about 2 cups. This one would work great with apples and pears, hard bread sticks or pretzels, and possibly celery and kohlrabi strips, depending on your flavor preferences. Add blue cheese to a medium bowl. Crumble finely with the back of a fork if needed. Stir in yogurt and milk and mix until well blended. Shell pistachios. Rub off any excess husk/skin. Coarsely chop the nuts. Set aside a few for garnish, if desired. Mix the rest of the pistachios with the blue cheese blend. Place in storage container, cover and chill. To serve, place dip in serving dish and garnish with reserved pistachios. Also goes well with veggies, slices of homemade French bread or pita bread. Makes a delicious and unique baked potato topping. Mix ricotta and heavy cream in a medium bowl until well blended. Stir in the chopped walnuts, reserving a few for garnish if desired. Mix in the parsley. Add salt and pepper to taste. Cover and chill. Use within one week. To serve, place in serving bowl and garnish with reserved walnuts. Would also go well with veggies, bite sized bagel pieces or slices of homemade French bread or pita bread. Makes an excellent baked potato topper! Wonderful combinations I never would of figured out to go with apples. I have apples in house. I will have to make a dip or two. thanks for sharing. Caramel is great, but I always enjoy trying new things. 🙂 Thanks for stopping by and leaving a comment. Sugar to taste – I don’t use much because I like the cheese flavor, but I’ve had it with up to half a cup. Mix everything but the milk, using a mixer is best. Scrape the sides of the bowl to make sure everything is mixed, then drizzle in the milk as it is running until is as thick or thin as you like. This dip is awesome on every kind of fruit, and I have used it as a dressing on fruit salad. 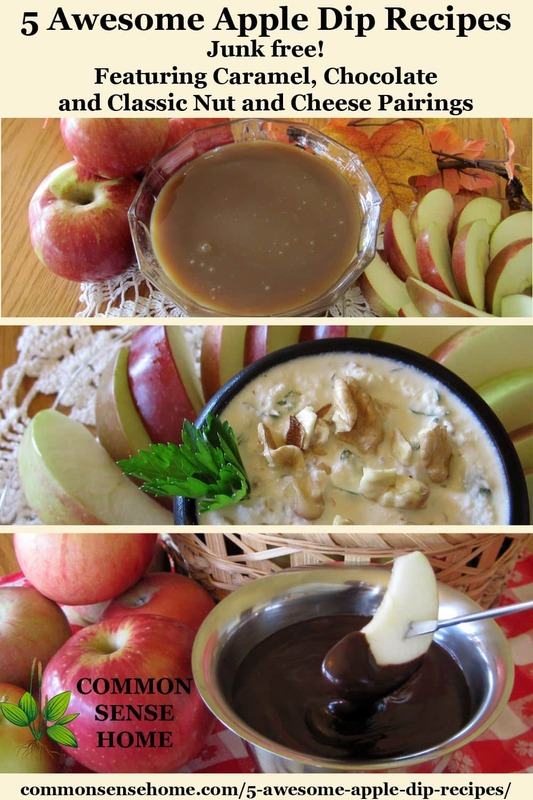 These sound SO good… I work with several women that love to have “harvest parties”… these dips would be perfect. Thanks for your “research”…. Just not all at once, unless you have a big family or are having a party. Otherwise it takes a while to eat them all up. 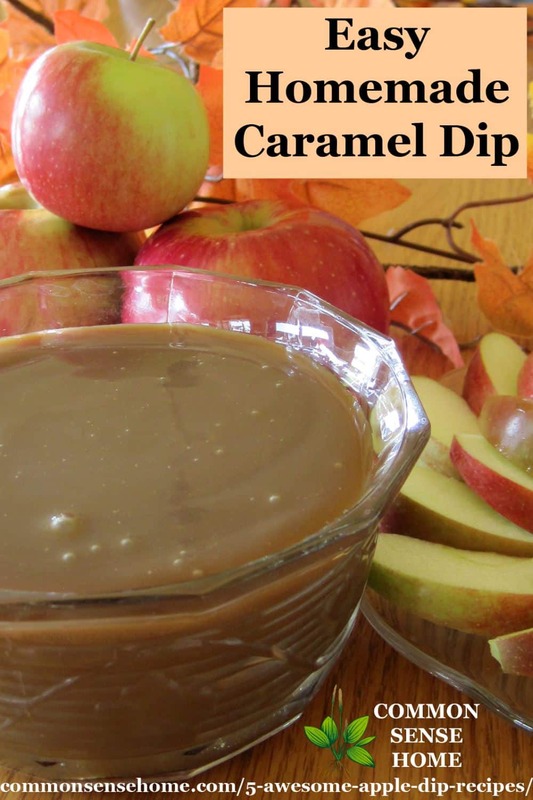 I tried this caramel dip for our Halloween dinner this evening. I’m delighted with it! I used Rapadura for my “light brown sugar” and the result is delicious. I’ve never been able to pull of caramel without it turning grainy on me. I never thought to add an egg. Yeah! Glad to hear it worked out well for you, too. Oh we are SO on the same page… I love apples, anything pumpkin and seasonal beverages this time of year! I have printed, bookmarked and am making these for our snack today. What combinations!! I would have never thought to make the last three, but they sound amazing! Can’t wait to enjoy these. Thanks my friend for ALL you do! It’s wonderful to savor the seasonal flavors when things are at their best. Thanks for stopping by, Tammy. My Grandma also used to put milk on our Jello. I think that was because in the 60’s in Hawai’i we had local dairies but the only cows we saw were Holsteins, a breed that doesn’t produce as much cream as many others. At that time most of our food was shipped in by boat. Whatever cream the dairies produced may have been directed to bakeries and restaurants. If you lived in town, Laurie, this may have been more of a luxury item for your Grandma too, even though your family ran a restaurant. I don’t remember getting cream or whipped cream until my Mom began to buy Avoset canned frozen aerosol dispensers manufactured on the Mainland. 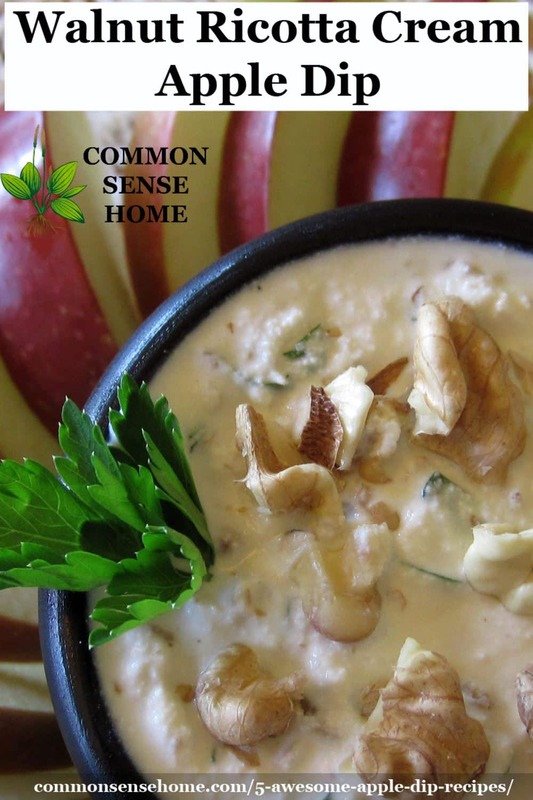 Apple with a creamy cheese base is a great idea. My husband loves cream cheese with celery and we are both minimizing sugar intake. He adds a little chili powder to nearly everything he eats, which works surprisingly well, even with fruit. He’s going to live these dips! Hi Sandy. Nice to hear I’m not alone in the jello/milk combo. We used to live on a dairy farm, so there was always milk, but we usually didn’t bother to skim the cream. It was just mixed in for serving. We did have Holsteins, though, so the milk wasn’t heavy with cream. I can’t wait to try these recipes! Thanks for the informative newsletter!